Bolton Council in the United Kingdom may soon see the construction of its first zero-carbon underground home. Designed by Make Architects for green enthusiast and British football star Gary Neville, the one-story, nearly 8,000 sq ft structure has been designed to be beautiful and functional while keeping energy consumption to a minimum. Far from classification as a drab bunker, this thoughtful design not only considers its eco-impact, but keeps in tune with the tranquil and expansive meadows and hillsides which surround it. The positioning and orientation of the property was carefully thought out, building materials will be locally sourced, and traditional building methods will be used where possible. A ground source heat pump will provide the heating and photovoltaic panels and an on-site wind turbine will generate renewable energy. Almost all of the home will be constructed into the hillside, which, according to the design firm, “enables the surrounding moorland to seamlessly flow across the roof.” The layout takes the form of a flower, with the “petals” hosting areas to eat, relax, entertain, work and play, all around a central kitchen. When lit at night, the house will leave a distinctive, glowing floral impression on the darkened landscape. Amusingly, some have compared the structure to the famed Teletubby house, which admittedly shares some aesthetic value. However, the architects at Make contend their inspirartion arose from Skara Brae, a neolithic underground settlement in Orkney. While the house will likely be quite costly, the eco-standards it is implementing will certainly make it a worthwhile and impactful venture. The structure has already been selected as an exemplary project within the Government’s ‘Planning Performance Agreements for Renewable and Low Carbon Energy Schemes’, and it is anticipated to be so advanced that the government is considering using the scheme as a benchmark for all future zero-carbon developments. The team hopes that construction permits will be granted soon in order to commence preliminary work on the residence this year. It does Look cool, but what happens when it rains? Seems like it would get flooded if there isn't adequate drainage. Also, how do you keep your vehicle from getting sun/weather damaged since the parking area isn't covered? I like that underground home. I would love to live in one. Energy input has got to be zero, for heating and cooling that is. Very cool! I've often wondered about -- and longed for -- a home underground. What is the literal footprint of this home -- i.e., how much land is being used -- and how many residents will such a structure accommodate? This is a fantastic design! I'd love to be able to see it in person and get a feel for what it's like to walk through the space. The walls around the teardrops would have to be a bit higher in rattlesnake (and other creepy-crawlies) country though. The ancient becomes modern, and not a moment too soon. Here in rural northern California the opportunities for this type of housing are endless, and our culture of innovation should be fertile soil for underground housing. However, many years of experience tell me that simple intellectual inertia can be a real idea killer. Convincing local planning and health officials as well as homeowners and investors of the soundness of this approach will be no easy matter, at best. Being able to point to real world examples like this can be helpful and hope springs eternal. Design may save the world, but only if the powers can be convinced to pull their collective head out of....ahh....the ground and put some houses into it, windmills upon it etc. Congratulations to the team at MAKE. It would be interesting to hear more about their experience with the planning and approval process. 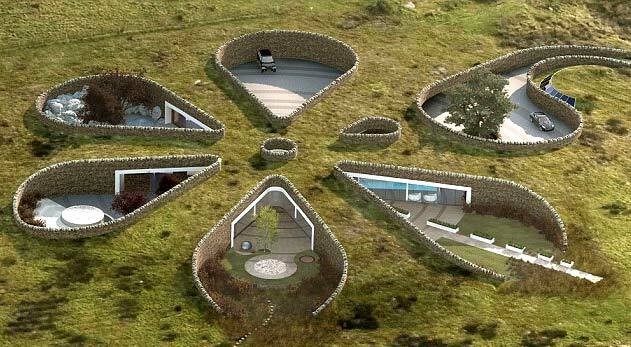 Almost all of the home will be constructed into the hillside, which, according to the design firm, “enables the surrounding moorland to seamlessly flow across the roof.” The layout takes the form of a flower, with the “petals” hosting areas to eat, relax, entertain, work and play, all around a central kitchen. When lit at night, the house will leave a distinctive, glowing floral impression on the darkened landscape. Amusingly, some have compared the structure to the famed Teletubby house, which admittedly shares some aesthetic value. However, the architects at Make contend their inspirartion arose from Skara Brae, a neolithic underground settlement in Orkney. While the house will likely be quite costly, the eco-standards it is implementing will certainly make it a worthwhile and impactful venture. The structure has already been selected as an exemplary project within the Government’s ‘Planning Performance Agreements for Renewable and Low Carbon Energy Schemes’, and it is anticipated to be so advanced that the government is considering using the scheme as a benchmark for all future zero-carbon developments.